Fox brothers Rusty and Rojo toil and till in their vegetable garden all summer long until they're finally ready to make their splendid, scrumptious, marvelous rabbit stew. Then they begin to pick colorful ingredients one by one, from lean, green runner beans and crunchy orange carrots to fresh sprigs of parsley and roly-poly blueberries. Meanwhile, their pet rabbit watches with his bunny family, all of them getting more and more worried about what's coming next. Finally the brothers have almost everything they need. All that's missing is one...big...round...white...bowl! And in a deliciously sweet surprise ending, they use the bowl to serve the concoction to their favorite rabbit, Stew! And his family, too. 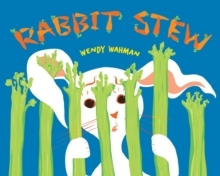 The whimsical and vibrant artwork is filled with clever details, and every scene includes Stew, his three baby bunnies, and their mother, all trying to stay out of sight, creating a search-and-find element for every spread.